This book offers an accessible and broadly conceived examination of the impact of globalization on comparative politics. Written in a lucid and lively style, it assumes no prior knowledge of either globalization or comparative politics, and is the ideal textbook for students who want to know more about these crucial topics. The world has changed substantially since the end of the Cold War and the collapse of the Soviet Union in the early 1990s. There is much debate – but little agreement – about what precisely has happened, and how it affects what goes on politically and economically within countries. At the centre of the debate are the forces and processes of globalization and how they impact on domestic outcomes in various kinds of countries. · How do various aspects of globalization affect outcomes within countries? · What are the implications of globalization for our understanding of comparative politics? By focusing on three kinds of countries – established democracies, transitional democracies, and non-democracies – Haynes explores how domestic outcomes are affected by contemporary globalization. Throughout the book, key topics are explained, including regionalization, economic globalization, the natural environment, political culture, regime change and democratization, political violence and terrorism, religion, human rights, and women and political participation. These themes are developed within a consistently comparative perspective. This volume will be of immense value to all those interested in one of the great debates of our time. It will be essential reading for students of comparative politics, international relations, and globalization. "Jeff Haynes brings about an unusual double achievement in this book. He has constructed a well-ordered and organised account of the impact of globalization on established democracies, transitional democracies and non-democracies. In doing so, he also offers a useful way of interpreting these, with highly insighftul implications for the craft of comparative politics." "This is a very well researched book both theoretically and empirically, which is strengthened by selective use of case studies. It is tightly focused and the chapters are woven together effectively. Combining provocative questions with nuanced analysis, Jefrey Haynes can not be accused of shying away from complex theories and issues. His scholarly endeavours deserve commendation." Major new textbook for students of comparative politics and globalization. 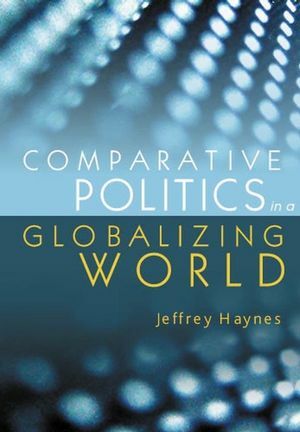 Focusing on three kinds of regime - established democracies, transitional democracies, and non-democracies, Haynes explores how contemporary globalization is affecting domestic politics across the world. Throughout the book, key topics are explained, including regionalization, economic globalization, the natural environment, political culture, regime change and democratization, political violence and terrorism, religion, human rights, and women and political participation. Challenges the artificial disciplinary gap between comparative politics and international relations, and tackles complex theoretical and empirical material with clarity and verve. Offers a fresh approach to the study of international politics today.